Primary Natural Resources petroleum, hydropower. ALBANIA IS UNIQUE in many ways. This small, mountainous nation on the western side of the Balkan Peninsula has a language and a culture that differ significantly from those of its neighbors. Most notably, it is the only country in Europe with a majority Muslim population. 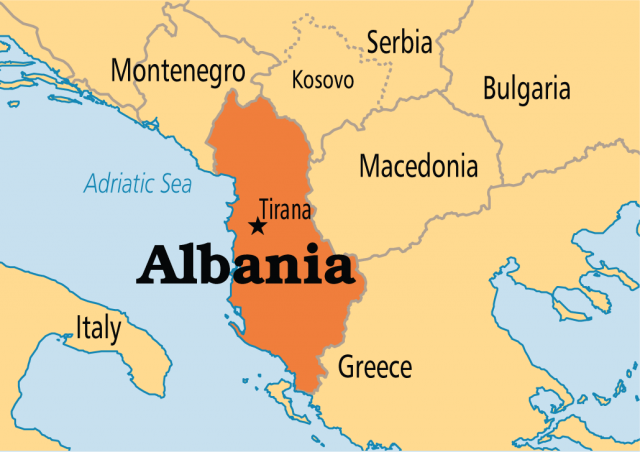 Albania has been isolated from the outside world for most of its history, at first because of the physical inaccessibility of its terrain and later because of 500 years of occupation by the OTTOMAN EMPIRE. Even during the period of communist rule after World War II, Albanian leaders pursued their own individual course in spite of pressure from its larger neighbors in Yugoslavia and the Soviet Union, resulting in one of the most isolated nations in the world—politically, economically, and culturally. Since reforms began in 1990, Albania has struggled to catch up to the rest of Europe, lagging far behind in political and economic development. Almost all of Albania is mountainous, from the southern reaches of the Dinaric Alps in the north to the various smaller ranges to the east and south. These ranges form Albania’s borders: SERBIA AND MONTENEGRO to the north, MACEDONIA (Former Yugoslav Republic of Macedonia) to the east, and GREECE to the south. Many Albanians live across these borders, however, principally in the province of Kosovo to the northeast, but also in Macedonia and Greece. The numbers of Albanians living in these regions is frequently debated and is the cause of regional tensions, as Albanians seek to find a unified voice for themselves throughout the Balkans. The narrow coastal plain along the ADRIATIC SEA is the site of Albania’s limited agricultural output, raising products suitable to a warm Mediterranean climate: citrus, figs, grapes, olives. The plain is watered by Albania’s major rivers, the Drin, Ersenn, and Semani. Higher elevations are suitable for growing wheat and for tending sheep and goats. The mountains also contain mineral wealth, but Albania lacks the resources to extract them profitably. Where the mountains meet this plain is where most of Albania’s larger towns are located, including the capital, Tirana, at the foot of the Dajti Mountains. The other major cities are Shkodra in the far north, Durrës on the coast, and Vlora in the far south, where the mountains come right down to the sea. These latter three cities, long important for trade in the Adriatic, were Venetian merchant republics for much of their history, reflected in their historic names, Scutari, Durazzo, and Valona. Today, most Italian influences are gone, and these cities are repopulated with ethnic Albanians, a people whose origins are unclear, but who are believed to be the region’s oldest inhabitants, predating the neighboring Slavic peoples by several centuries. Their language is believed to be derived from that of the ancient Illyrians, a people whose kingdoms once dominated the Balkan Peninsula until they were conquered by the Romans in the 1st century B.C.E., then pushed out of much of their original territory by migrating Slavs in the 6th to 8th centuries. A medieval kingdom was resurrected in the 15th century under Albania’s principal national hero, Skanderbeg, winning a notable victory over the Ottoman Turks in 1449. But within 40 years, Albania had fallen to the Ottomans and had to wait until 1913 to recover its political independence. In the meantime, Albania became the only European province of the Ottoman Empire in which the majority of its inhabitants converted to Islam, and Albania contributed significantly to the development of the Ottoman state—several of its sons rose through the ranks to become grand vizier, chief minister of the sultan. After gaining independence, Albania veered from republic to monarchy and back before submitting entirely to the strict socialist regime led for four decades by Enver Hoxha. During this period, Albania’s economy was 100 percent nationalized (even personal cars were owned by the state), and diplomatic ties were cut with all of its former allies, Yugoslavia, the Soviet Union, and finally, even CHINA, leaving Hoxha’s regime completely isolated. Since 1992, a new regime and a new constitution have attempted to reverse the mistakes of the past fifty years, but Albania remains the least developed country in Europe, with about half of its population working on small farms and half of its industry shut down. Today, much of the national income derives from remittances sent back from Albanians working abroad, mostly in Greece and ITALY.